Photo courtesy of Cheri Lucas. Who are these people? What’s their relationship? Are they saying hello or goodbye? Or something else altogether? 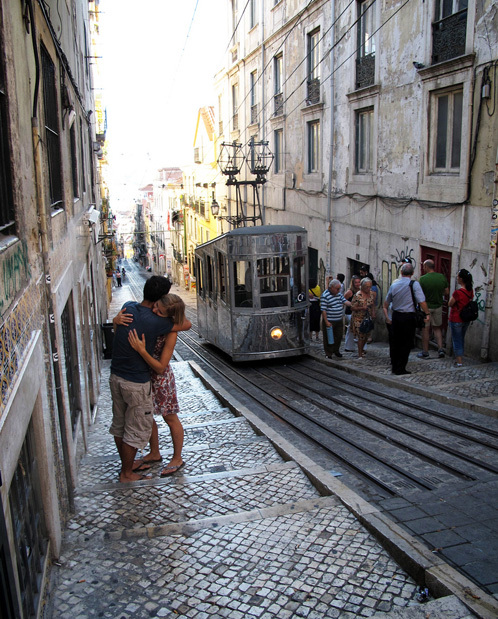 Are they just clinging to one another to keep from sliding down the steep cobblestones? Who’s coming/going, and why? Where are they coming from/going to? Are the people behind them waiting for them? Are they happy for the couple, or irritated? When was the last time you had a joyous reunion or difficult departure? How does looking at this couple make you feel? Have you visited or lived in a place that looked like this? Could you use a hug? Why? As with the last “1,000 Words” challenge, we know you’re going to see things in this photo that would never have occurred to us, no matter how long we stared — and that never would have occurred to the actual people in the photo. We can’t wait to see where you go. ETA: Just to clarify, your post doesn’t actually have to be 1,000 words. Use as many (or as few) words as you think your post needs. This challenge is going to be fun! I look forward to brainstorming and getting my post down on the page…I can already feel an idea forming. Can I try my hands on this? Does this have to be something new, or can I use an old blog posting? We ask that challenge entries be written specifically in response to the challenge — new post, please! A fun competition- worth taking to exercise the neurons! Reblogged this on Martha . Del . Valle .. This is my first writing challenge attempt, I chose to write about a difficult departure, saying goodbye to my mom. This was therapeutic! … even if I did shed a tear or two. ****Ooooh this will be the first time I try this with a picture..Neat idea! I hope she’ll enjoy the ads! awesome! I wasn’t there for take 1 as started here with jan 1 so this should be interesting! I did seriously enjoy your take. Both with the photo and the emotions. I used to do a lot of photoging, and you captured it just right! Thank you very much BuffaloStar :-). I adore photography, but I am by no means a pro. So, I am grateful for your compliment! Does it have to be a thousand words or can it be less? Thanks. I believe it’s a play on the saying, “A picture is worth a thousand words.” Last time there were short stories, poems and non-fiction essays of varying lengths. Yup – totally up to you! Write as many words as you think the post needs. Love the challenge! Can we put the picture in our post? Sure, go for it – just keep the credit in. I had three guesses before I looked it up … all wrong! I’m loving how many different locations, perspectives, back stories this challenge is generating. I’m going to give this ago offline and then post my effort later this week. Go have some fun, follow the link and get writing! Thank you to everyone who has liked my post so far! Now, how does one get freshly pressed? Great! Thank you for replying, Michelle! LOL! That was a good one! Brand new to this entire world of blogging. I have been told by many to start blogging my journals, my children story books and my daily goofy encounters. I would love to participate as my mind has already wrapped up the first image and ready to take the challenge. However, I am so challenged on this technical stuff I am having major difficulties in setting up and finishing my home site. Not even sure where to click to even start submitting my 1000 words. Maybe next time. Goodluck bloggers have fun creating and sharing today on this challenge. Just write a post on your own blog – that’s all there is to it! You don’t have to submit anything. Oh, man, this one is a show stopper! Whoa… sometimes sounds say more then words so… whoa! 🙂 ❤ That was perfecto! Stop Along The Way Weekly Writing Challenge, Take Two: Wait, What Are We Doing? Someday I Will Learn Weekly Writing Challenge: 1,000 Words. Cable up! Pilipino Ang Wika Ko Weekly Writing Challenge: Paano ako magpapaalam? ranDom muZings Weekly Writing Challenge! In the Spaces Between Words and Images Weekly Writing Challenge: He-djfoi icki foilium nuk nuk?